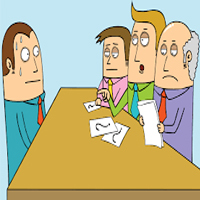 Here, and throughout the interview, a good answer comes from having done your homework so that you can speak in terms of the company's needs. You might say that your research has shown that the company is doing things you would like to be involved with, and that it's doing them in ways that greatly interest you. For example, if the organization is known for strong management, your answer should mention that fact and show that you would like to be a part of that team. If the company places a great deal of emphasis on research and developments emphasize the fact that you want to create new things and that you know this is a place in which such activity is encouraged. If the organization stresses financial controls, your answer should mention a reverence for numbers. 8. Please give me your definition of [the position for which you are being interviewed. Keep your answer brief and task oriented. Think it in terms of responsibilities and accountability. Make sure that you really do understand what the position involves before you attempt an answer. If you are not certain, asks the interviewer; he or she may answer the question for you. Keep your answer achievement and task-oriented. Rely on examples from your career to buttress your argument. Stress your experience and your energy. Present a positive and confident but don't overstate your case. An answer like, "Everything's wonderful! I can't think of a time when things were going better! I'm overjoyed!" is likely to make an interviewer wonder whether you're trying to fool him . . . or yourself. The most convincing confidence is usually quiet confidence.